The Wedding Planner Magazine | The Joy of Children in your Wedding Party adds more to your special day. Having children in your wedding party adds to the charm and warmth of your special day. As you embark on life’s journey with your soulmate, children serve as reminders that although time passes, the child inside always sustains your sense of wonderment and hope for the future. Older children can serve as bridesmaids, groomsmen, and ushers. Those who are too young to assume these roles can participate in the wedding processional in a variety of ways. 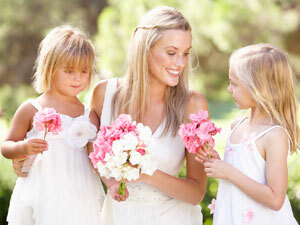 Flower girls carry bouquets or flower baskets to scatter before the bride. Typically, the girls range in age from four to seven, and are close relatives of the bride or groom. In large families, more than one young girl can be chosen, in which case they walk in pairs. However, they do not take part in the receiving line. A four-to-seven-year-old close male family member of the bride or groom can participate as a ring bearer who carries the rings on a white decorated cushion. If the ring bearer carries symbolic costume- ring replicas, the original rings remain with the best man and maid of honor. If the child bears the actual rings, these must be securely affixed to the cushion with ribbons or pins. When the ring bearer reaches the end of the processional, the best man takes the rings from the cushion. Train bearers are typically young girls and boys – though they are older than the ring bearer and flower girl(s). Typically, girls fulfill this role in the English-style ceremonies, while boys assume the responsibility in the United States. Unless the child is well-behaved and rehearsed, the train should be left unattended for safety reasons. Children can also be included in the wedding party as junior bridesmaids, junior ushers, and pages (the latter are young boys who walk with the wedding party). The requirement of formal attire and finery gives each child a sense of moment, responsibility, and involvement in the ceremony, making their personal experience more meaningful and memorable. The inclusion of children also adds to the joy and aesthetic pleasure of the festivities for all participants and guests.